Dennis Tridents with a ZF gearbox are thin on the ground now. 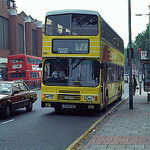 A few remain with London United, Metroline and Sullivan Buses, any more? Would have been better to be there in the Scania Metropolitan era. I went to Reading at the tail end of the Metropolitan era on a bus photography trip, but by the time I got to uni there in 1993 they had (just) all gone. Did very much have the ex. Harrow Buses Mk.2 Metrobuses though, which I did like. I have a fair number of Reading Scania Metropolitan photos to scan and load to Flickr. Includes ex London and T&W PTE examples. My job was relocated to Reading against my wishes in 1986. When the Routemasters appeared there, it was a small positive step. Back in tfl territory now, thankfully. Metroline looks likely to lose its remaining TAs soon, the VPs look like ending during 2018, the VPLs end their contract 5 weeks into 2019. The single deck DLDs might go this summer. Metroline looks likely to lose its remaining TAs soon, the VPs look like ending during 2018, the VPLs end their contract 5 weeks into 2019. The single deck DLDs look likely to go this summer. Metroline's DLDs will be needed until the 214 transfers to NP in August 2019. Unless Metroline temporarily use some of the ex-First DEs (e.g. from the 95, 223 or 224). It can't use either from April 2019 because that's when begins ULEZ.